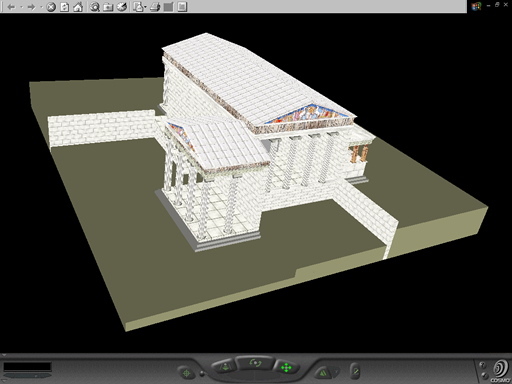 The aim of this paper is to present a Virtual Reality Modelling Language VRML exploration of the Erechtheum in Athens. It addresses the 4th grade students and it constitutes a teaching approach trough the use of various representations created with VRML language. The design principles of the applications are described in detail as well as the technical characteristics of the application. A pilot evaluation of the teaching approach is also presented and the results indicate a strong positive impact on students' performance. The application also aims to emphasize the significant advantages of VRML as an efficient way of offering ICT course materials to students. 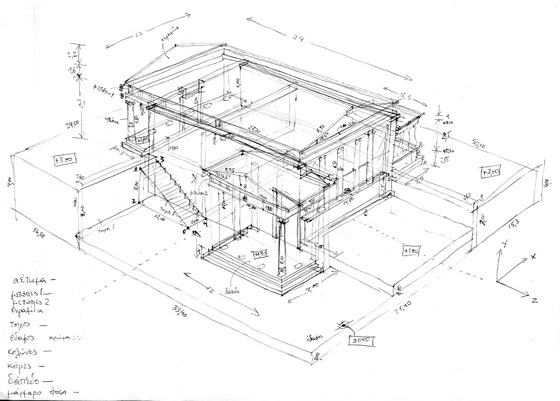 Keywords: 3D STRATA Studio; 3D CAD; VRML; HISTORY; Erechtheum. Education has been influenced by the changes in the area of Information and Communication Technologies (ICT). The arguments for and against ICT are powerful and have triggered off a great interest in the issue of ICT induction in education. As a result a huge number of articles has been published which study this issue through a number of perspectives and provide the ground for further research. Some applications of ICT in education are the induction of movement techniques, movements with graphics, and simulations, the development of visual experiments, speedy exploration of data and observations storing, the development of multiple reconstructions etc. The greatest contribution however, of ICT in the educational process is the potential of modelling and simulating phenomena and procedures that facilitate scientific research and the exploration of the real world (Borkowski, 2002), in contrast to the procedure of simply acquiring knowledge out of a book manual. According to Brant et.al, (1991) modelling is a computing process which includes a manageable and interactive environment and it corresponds to a real phenomenon or a theoretical system (Akpan, 2001). ICT provide also the tools that help students decide easily about the results of natural processes, interact with the software applications, carry out their own explorations on an individual or collective level etc. ICT introduction in education establishes a dual relationship between the ICT and the learning theories and the teaching practice, since it reframes the teaching methodology of sciences through the use of ICT while it also brings up the crucial issue of teaching thinking skills through the use of ICT in the framework of a constructive learning environment. ICT contribute to the student's participation into the learning process and the invention of ways, which facilitate the active construction of his knowledge structure, as well as the understanding of this process. The fundamental principle of constructivism (e.g (Reiser 2001, Strijbos et.al 2004) is the active initiative and the control of learning by the learner, the personal construction of knowledge, that is the self-control of learning (de Charms, 1983; Deci & Ryan, 1985) and ICT can give a shift towards that direction. The implementation of Information and Communication Technologies (ICT) can offer to both students and educators alike, quick access to historical sources, libraries and museums. Through the so-called "discovery learning", they may also participate in research or problem-solving activities which help acquire a wider and broader perspective of History. One of the ways of utilising ICT is through VRML. Recently, an increasing number of educators have access to virtual reality. Through the Virtual Reality Modelling Language (VRML), teachers and students can have a direct access to 3D learning environments on the Internet. VRML gives teachers the opportunity to enhance their students' knowledge, while simulated spaces can help students visualise information in new and realistic ways, give abstract concepts a realistic flavour and encourage cross-cultural, global communities. Corporate VRML today tends to be focused primarily on enterprise and entertainment which do not usually contribute towards educational goals. As a response to this issue, an educational world for the Erechtheum has been developed, in an attempt to encourage a wide use of these simulations in traditional subject areas. We have developed a virtual reality environment illustrating an Ancient Greek Temple. 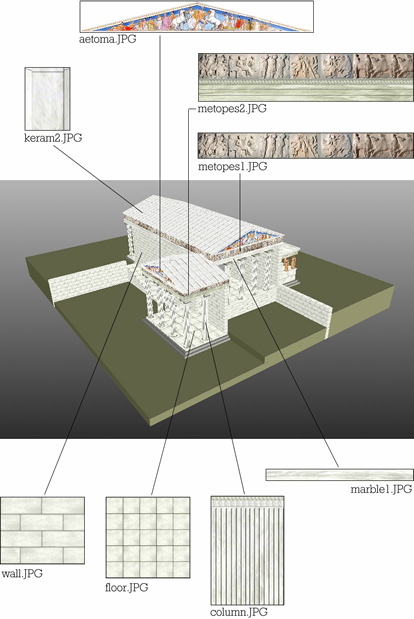 We chose the Erechtheum as our case study, which, due to its structural complexity, gives us the opportunity to fully explore the capabilities of VRML, such as complex shapes(IndexedFaceSet) application of textures (on simple and complex shapes) grouping of objects, various co-ordinate systems etc. In Figure1 we present the parts of Erechtheum and using the Cortona Client Software Program ( http://www.download.com/Cortona-VRML-Client/3000-12777_4-10359613.html) students could explore the different parts of Erechtheum. In order to simplify the location of the position of objects, the origin (0,0,0) of the root coordinate system is placed at the centre of the main temple and at an elevation which corresponds to the lowest level of the ground. Furthermore, we used the following drawing (Figure2) in order to calculate the coordinates of a number of objects designed. We used scale of 1:10 relative to real-life dimensions (this was done as the use of real dimensions caused a problem in the output of the environment through the browser). We created groups of objects and placed in space (relative placing of objects in the local coordinate system, aggregate placing in the root coordinate system). We installed the object (Caryatids), following prior construction on 3D CAD, with small adjustments on the VRML code. During the design of the environment (description in VRML), some simplifications and assumptions were made. These include: the pediments and metopes have adopted elements present on the Parthenon (as the equivalent information for the Erechtheum is unknown), the real dimensions have not been adhered to exactly etc. We created source code in VRML using the editor VrmlPad, the Cosmo Player Plug in and Photoshop for the creation of textures (Figure3) . Ground: Shows significant irregularities. It is made up of 6 boxes of varying sizes (4 coloured boxes for the creation of the ground irregularities and 2 boxes with a "wall" texture for the creation of two retaining walls for ground support). Floors: Made up of thin boxes (0.30m) with a floor texture, variable scaling (depending on the size) for improved output. In particular, two shapes IndexedFaceSet were implemented for the ramp on the exterior of the structure, namely a vertical triangle and a parallelogram for the inclined surface. Walls: These are made up of boxes of thickness 0.60m with a "Wall" texture, each of which contains on its upper surface one narrow box of thickness 10cm and marble texture. The textures can be adjusted by different scaling such that uniformity is achieved. The interior divider is essentially a box with a colour texture. Columns: These are of two types which differ in height. The first type is used on the front and rear of the temple and the second is used on the side (north). The columns form a group of objects (cylinders and one box) which can perform relative translational and rotational motions so that they can accurately be placed in position. Having formed the group as a whole, it is then moved to the root coordinate system so that it can be placed in the building. Metopes: These are boxes forming horizontal plates. The middle one is larger in height and portrays the metopes (metopes1, metopes2), while the rest-using marble texture-are slender and protrude slightly along the perimeter. Tiles: These are made up of very thin boxes which can be translated and rotated to the desired angle so that they are in accordance with the pediments. Their texture is marble tiles (Keram2). Pediments: These are essentially triangles constructed using IndexedFaceSet, and the texture (aetoma) is achieved through the Texture Coordinates. Statues: For the creation of the Caryatid, the 3D STRATA Studio programme was implemented, which created the body of the statue in IndexFaceSet version. Following this, the two bases (upper and lower) were added and the image of the statue as texture. This object was used 6 times in total, each time in the appropriate position, as an external object (inline). The aim of the research was to examine the role of VRML software at students' cognitive achievement in the framework of the teaching and learning process. For the research, we have used two classes (Grade 4) from a Primary School of Athens. Both classes consisted of 25 students with approximately equal distribution of boys and girls. One of the classes – which was characterized as the control group - was taught the concepts of Erechtheum, applying the constructivist approach through the use of the relevant school textbook. Students were motivated by the teacher to think about Erechtheum and they were involved in the different phases of constructivist approach to learning and teaching (Engage, Explore, Explain, Elaborate and Evaluate) (Bybee, 1997). The main differences of the teaching process for the two groups concerned the way of the implementation of the above mentioned phases. Students of the control group were exposed to pictures of the Erechtheum, they were asked to describe in brief what is, who was the creator, what is the main issue they think makes that to be famous e.t.c.. Next, students were taught the different parts of the Erechtheum using the text book, they explore the parts of it using the pictures provided by the book and they discussed with the teacher the architecture of the Erechtheum as well as aspects like the materials used to construct that, the colors used etc. The experimental class was taught concepts through the use of the school textbook but teachers also demonstrated the software and students exploited the Erechtheum with the aid of the teacher. Students were motivated to go through the Erechtheum using the buttons provided by the software and during that exploration we noticed that a type of dialogue was developed concerning the status, the dresses at that time, the geometry of the space and the techniques of the sculpture. For the experimental and the control classes the teaching units were equivalent but the experimental unit devoted two more teaching hours for the demonstration of the VRML application. Before starting teaching a common pre-checking test was given to all of the students in both classes in order to estimate the students' cognitive level about issues relative to Erechtheum. After the end of the teaching process a common post test was given to all of the students. Finally, teachers were encouraged to discuss about the experiences they had in their teaching and to identify effective teaching and learning which had occurred, as well as problems which had noticed. The students' cognitive achievement (at the initial test) average in the two classes was Μ=1,7 SD=0,3 for the control class and Μ=1,8, SD=0,5 for the experimental class(maximum grade is 6). Analysis of co-variation ANCOVA for the two groups and the pre- and the post-test yielded the following results: The F ratio that refers to the relations between groups of the research design (two groups and two tests) is 10,542 with p significance less than the 0,001 level. Thus, we accept that the interaction is highly significant. After the teaching process,the cognitive achievement average for the control group increases from Μ=1,7 to Μ=3,8 whereas as the experimental group is concerned, it increases from Μ=1,8 to Μ=4,9.The difference between the averages for each class is statistically significant. For the control group t=-5,446 with significance level p<0.001 and for the experimental group t=-8,489 with p<0.001. From the results, there is strong evidence that simulated spaces help students visualize information in new ways and give abstract concepts concrete form. Questions concerning the architecture and the geometry of space were found to be more difficult for the control group while students of the experimental group seemed to be more familiar with issues concerning the positions of the status, the distance between the, and the different geometric creatures of the Erechtheum. This project may be developed further using collaborative learning tools (such as CMAP) so that students are able to cooperate and explore relevant architectural issues, historical sources etc. (work in progress). Further research (in process) will be focused on using this application to investigate issues like : "How do students perceive the learning course in relation to the use of VRML environments? ", "Does approach to learning change over the duration of the course due to the use of VRML?" and "What metacognitive development takes place in the course due to VRML?". Akpan, J. P. (2001). "Issues associated with inserting computer simulations into biology instruction: A Review of the Literature". Electronic Journal of Science Education, 5(3). Available at: http://unr.edu/homepage/crowther/ejse/ejsev5n3.html. Borkowski J. (2002) NEST - "New Educational Technology for Science Teachers Training", Proceedings from UNESCO Global Forum on Learning Technology, Learntec Conference Centre, Karlsruhe, Germany. Brant, G., Hooper, E., & Sugrue, B. (1991). "Which comes first the simulation or the lecture?" Journal of Educational Computing Research, 7(4), pp. 469-481.
deCharms, R. (1983) "Intrinsic Motivation, peer tutoring and cooperative learning: Practical maxims." In Levine, J. and Wang, M. (eds.) Teacher and student perceptions: Implications for learning, pp. 391-398. Hillsdale, NJ: Erlbaum. Deci, E. and Ryan, R.M. (1985). Intrinsic Motivation and self-determination in human behavior. New York: Plenum. Reiser, R. (2001). "A history of instructional design and technology. Part 2: a history of instructional design." Educational Technology Research & Development, 49, pp. 57–67. Strijbos,J., Martens, R & Jochems, W(2004). "Designing for interaction: Six steps to designing computer-supported group-based learning." Computers & Education 42, pp. 403–424.